Set on Miami's famous Collins Avenue, 1 Hotel South Beach is close to the beach, shopping and just a 20-minute drive from Miami International Airport. 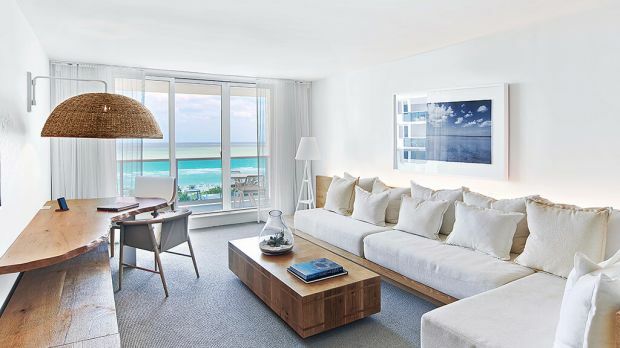 A chic retreat from the hustle and bustle of the city, LEED-certified 1 Hotel South Beach provides a soothing environment of natural wood furnishings and white surf lapping against golden sands. Four swimming pools and 429 accommodations await guests here, while a tablet with daily digital newspaper comes as standard. A pristine beach is located right outside the front door, with private cabanas and ample opportunities for people watching. If heading beachside sounds too rugged for you, retreat to the rooftop pool for panoramic views, delicious cocktails and a fun scene. There's also world class fitness and health facilities at 1 Hotel South Beach, headlined by the city's first Spartan Gym. The world renowned Bamford Spa offers an array of signature treatments on-site, while there's also the Salotto Beauty Salon. Standing out amongst the crowd of dining options in Miami can be difficult, but popular Habitat will give diners an extensive raw menu (tableside salad sommelier included) and a focus on grilled items from the land and sea. After dinner, retreat to the Rooftop Bar to relax poolside or Tom on Collins for live music and of course, a crafted cocktail at each. Send an availability request with your requested dates to the 1 Hotel South Beach.